Once more, California’s Air Resources Board (ARB) gives the Golden State a “cleaner” bill of health. That’s fantastic news! The economy is strong, the ranks of the unemployed have dwindled and greenhouse gas (GHG) emissions are falling. From a high of 489 million metric tons of carbon dioxide equivalent (MMTCO2e) units in 2004 to 2016’s 429.4 MMTCO2e units of GHG-emissions output (2016 is the latest year for which state GHG-emissions annual output data is available), the GHG-emissions-reduction picture looks good, though it’s too early to declare total victory just yet. While in the U.S. as a whole where transportation sector-based GHG-emissions output is around 28 percent of all generated emissions, in California, meanwhile, transportation’s contribution in percent is almost one-and-a-half times that or 41. Remember: This is relative to the emissions output of other sectors like agriculture, commercial, electricity, industrial, residential; you get the idea. 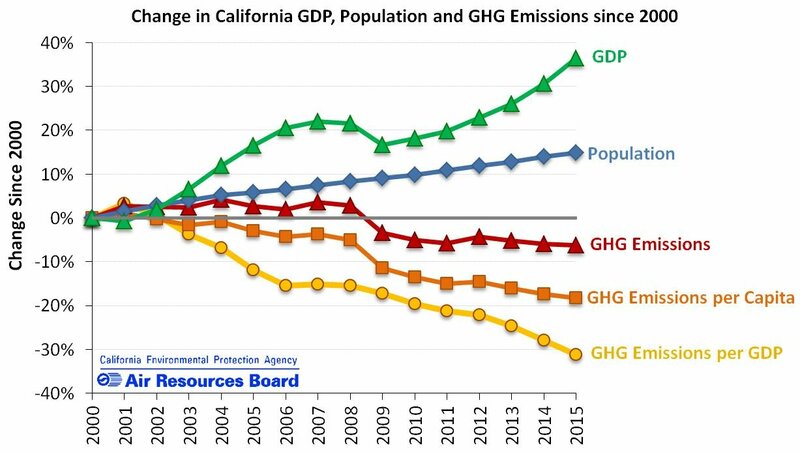 The other side of the issue is that transportation-sector-emissions-output in the Golden State is on the rise. The ascension in California transport emissions can be attributed to, among a number of factors, the growth in automotive use, miles driven, in other words. Little surprise here. The present increase in state vehicle miles traveled, incidentally, exceeds the pace or percentage rate of state population increase. This tells me Californians today are driving more than ever before. Just today I spotted the headline that reads: “Californians can ride in cars or fight climate change. They can’t do both.” Naturally, that sparked my curiosity. This is the Los Angeles Times’ “Readers React” feature, the reactions apparently in response to an earlier published L.A. Times article on the topic of climate change/greenhouse gas emissions. Interesting column or feature headline. Isn’t it though?! I’m just wondering why Californians can’t do both. One respondent, Chanell Fletcher of ClimatePlan, advocated for greater reliance on lightrail transit, trains and buses coupled with less car use. Also mentioned was land use and/or neighborhood configuration or maybe, more correctly, reconfiguration. Another, meanwhile, pointed to ridehailing activity adding to the traffic congestion mess due, presumably, to the number of vehicles in ridehailing service with single occupants. It’s a serious-enough problem, apparently. Electric cars, light-, medium- and heavy-duty trucks are but another answer. But, their numbers would have to rival those of registered vehicles in state equipped with internal combustion engines. The likelihood that this could happen some day is strong but it would likely take a while. Forgoing driving completely is, of course, one way to prevent transportation-emissions releases. But, expecting the bulk of the motoring population to completely give up driving, well, that’s expecting a lot and therefore, not a very realistic proposition. But, what can help when engaged in motoring activity, is less vehicle-engine idling. One thing is for certain: A paradigm shift involving locating jobs and shopping near or nearer to where we live, would be unprecedented. This plus greater exploitation of ridesharing – this was once referred to as car- or vanpooling. That’s a relatively easy and inexpensive fix and a solution that can be put into practice practically immediately. As it happens, one of the respondents intoned that, I would presume, a road trip that used to require a third-of-an-hour’s-time today consumes two-and-a-half times that. And, while this appears to be standard fare, what I haven’t seen any scaling back of, at least not in my neck of the woods – Fresno (of course, this central California-based municipality does not have the kind of severe congestion problems many other California cities have – at least, not yet, anyway) – are automobile advertisements on T.V. And, at times I find myself laughing out loud, what with the featured car, truck or SUV having the entire road to itself (in other words, there are no other vehicles to be spotted anywhere). Probably filmed on some far-flung, lightly inhabited but sizable island, you know, the kind of place whose very existence and survival is just as if not more likely to be threatened by rising seas. Ajay Verma on Solar power: If it works for trains, why not food trucks? Ed on Carbon-capture technology: An effective means to control climate?